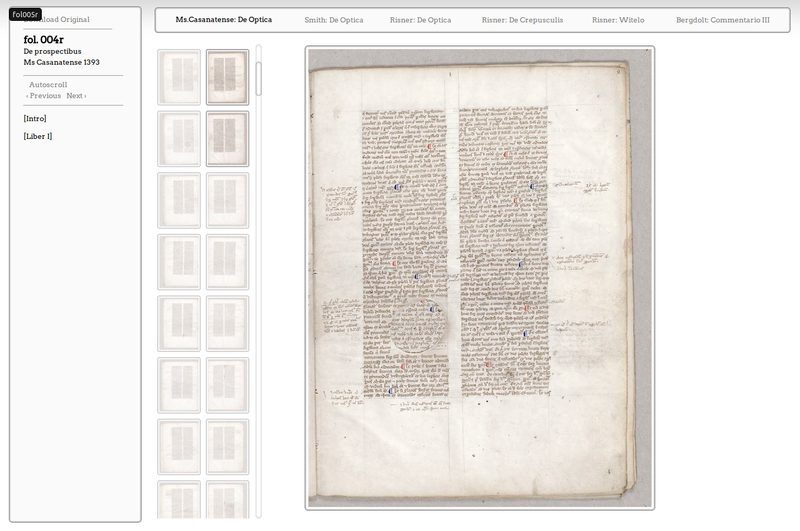 image scans of manuscripts like the already mentioned manuscript in the Casanatense library. Hopefully we will be able to show the manuscript in the Vatican library, too. Work on these documents is still ongoing, with some documents lacking only some text figures, others, most notably the Ghiberti, parts of the text due to the complexity of transcription. The finished project will be hosted on its own platform on a dedicated server. So, please don’t copy the present URL because right now what you see is the development version. 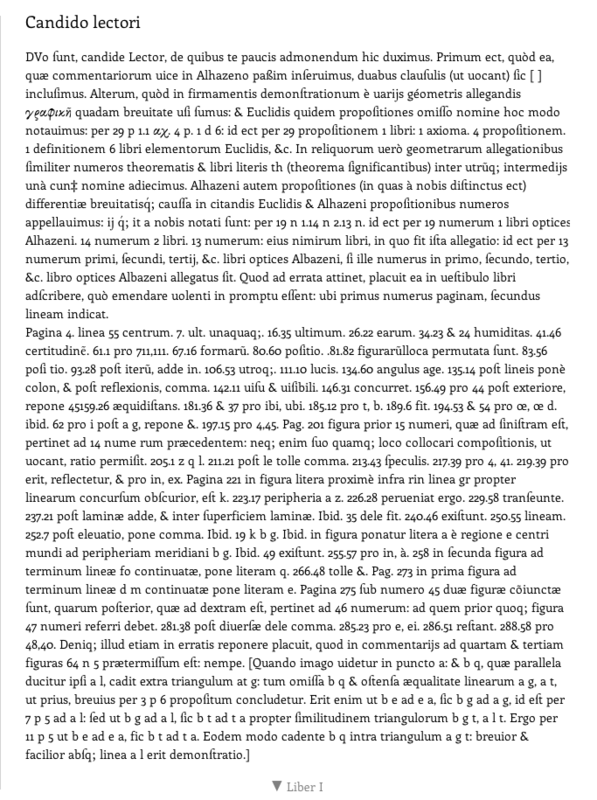 As you see, we present the Latin text side-by-side with Mark Smith’s English translation. I’m not too happy about these pop-ups. First, because there are not visible all the time but only if your mouse hovers on top of the relevant symbol. Second and most important, because it is hard or impossible to create a scientific annotation for a pop-up: I will come to this part later on. For now I just want to say that I will try to find another solution: maybe footnotes under each paragraph or in the page margins. Another challenge will be to add the necessary text figures alongside the explanations provided by Mark Smith. Most probably I will present these right inside the existing text documents. 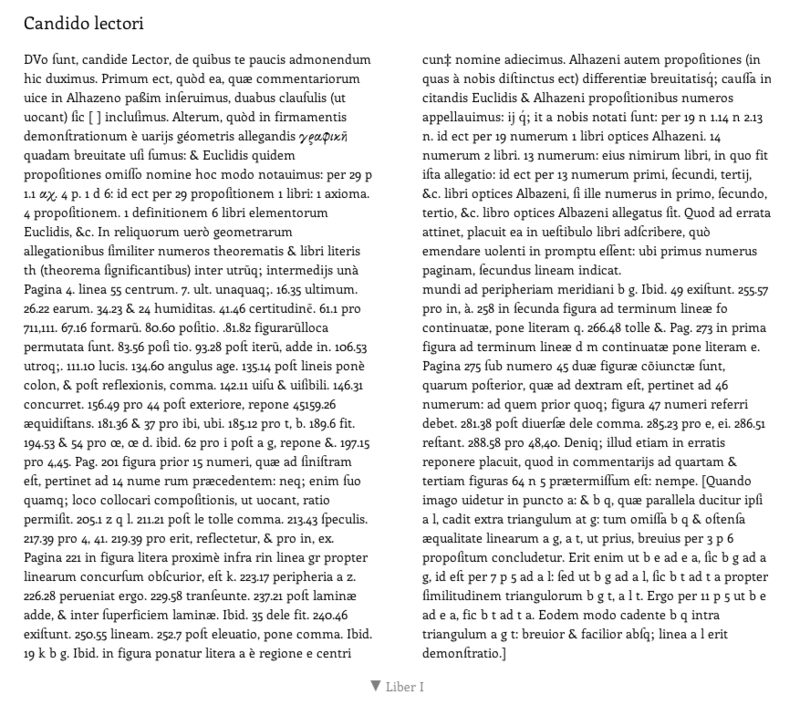 Let me also show you our approach regarding Klaus Bergdolt’s editon of Ghiberti’s Commentary, the third book. What I did here was something very similar to Mark Smith’s edition, with the rendering of the original Italian text alongside the German translation. 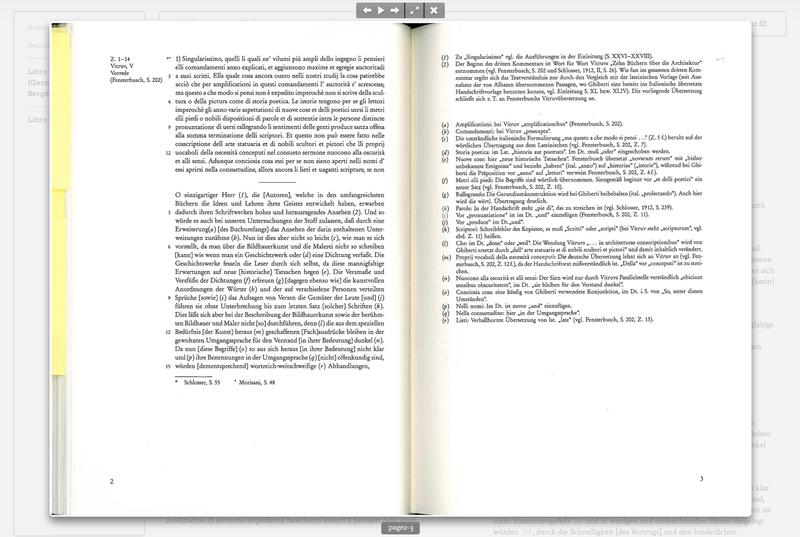 Unfortunately, there far more footnotes and they are of two separate types: notes regarding the Italian text, like in a text critical edition, and notes regarding its interpretation. I therefore decided to keep the original distinction by letters or numbers for each note, even more so as they are cited that way inside the text. 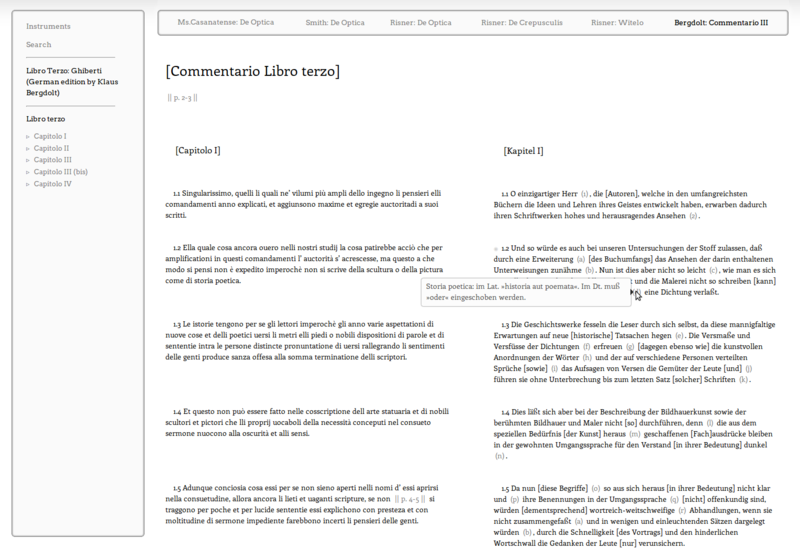 A full rendering of Bergdolt’s text will take some time, but I hope we can provide at least the Italian original and the German translation, adding the text critical notes sometime later. 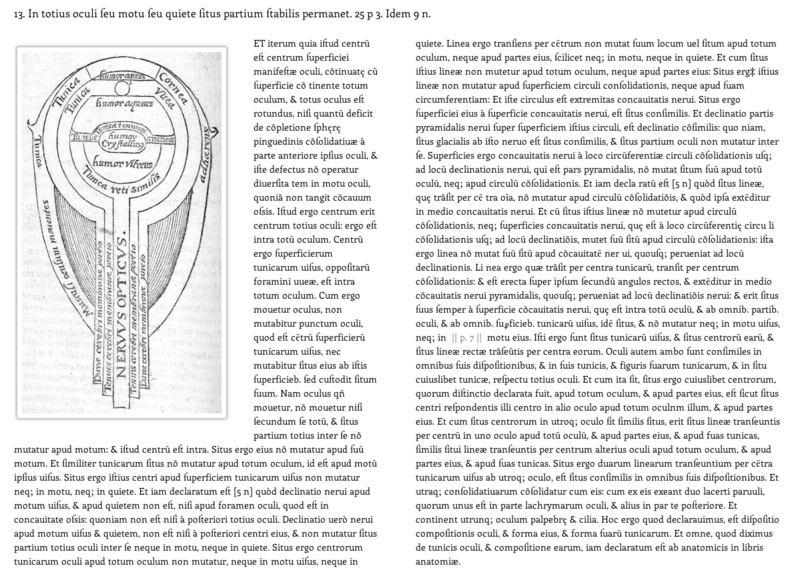 The single scans can be chosen from the middle strip and are then displayed in the main viewport, as it is more or less usual these days. We also also have an autoscroll feature which guides you through the document. We took special care to display the single scans always with maximum screen size, that is the page scan automatically adapts to various screen dimensions. As I mentioned earlier, we are also in contact with the Vatican library for a presentation of their manuscript inside the Perspectiva+ platform. Let’s hope we can get their permission! 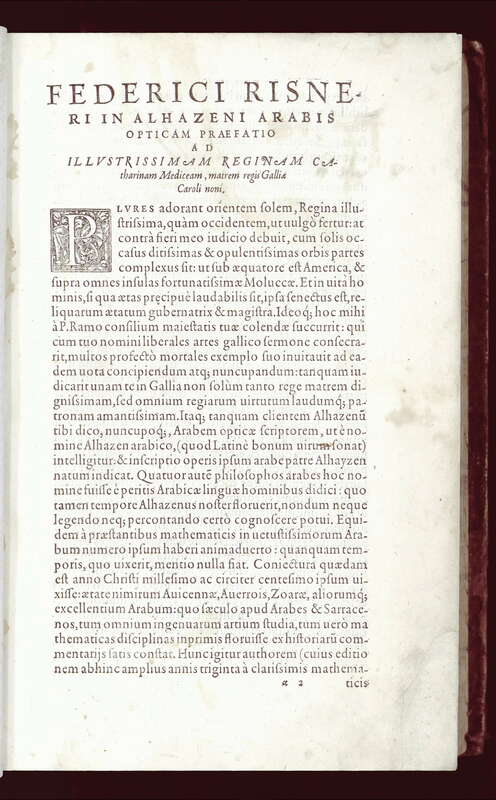 I will now speak of Friederich Risner’s edition of Alhacen and Witelo, which was printed in 1572. The scans for the print edition have been provided by the Documentation Service Strasbourg and the transcription was done by the ECHO project of the Max Planck Institute for the History of Science. Obviously, a normalized transcription, like the one displayed by the ECHO project, would be much nicer. But before I set out to modernize the transcription the underlying text first has to be checked for typos (of which there are many). Let me now turn to the task of turning the digitized text into modern edition. Text presentation always depends on its audience, its medium, and its time and place. For the Perspectiva+ project I tried to create a modern Risner which is highly legible and reusable for research. Therefore I did not want to maintain all aspects of the original print edition. This means that the layout is adapted to modern medium and a modern audience by re-ordering the text flow, reconnecting line breaks, suppressing page breaks, and so on. I always opted for legibility and re-usability. 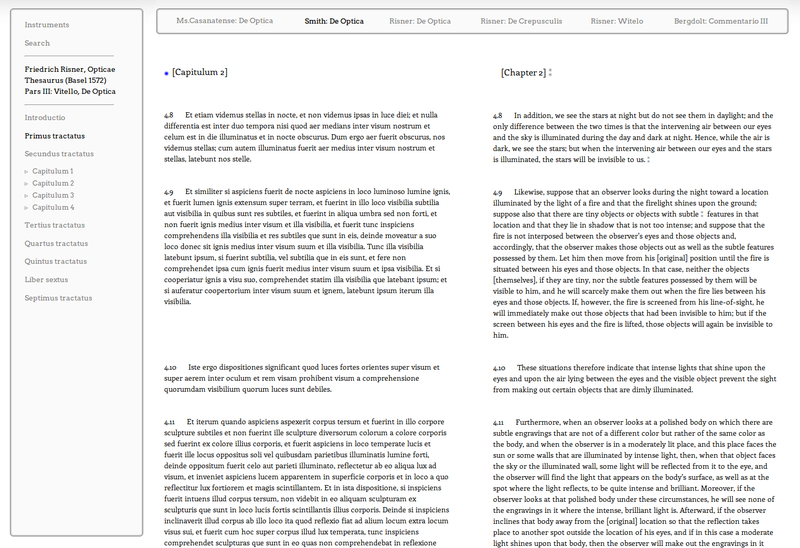 A hierarchy of first, second and third level headers for books, chapters and sections is presented in the toolbar on the left. Unfortunately, the resolution of the scans available to us was too low to allow for further enlargements. These interventions might be regarded as heretic, but please keep in mind that our goals are legibility and usability – not the presentation of a specific historical document in its most authentic state. Anyone interested in the actual state of the specimen has to consult the uncorrected RAW files or, better yet, the document itself. All fonts are automatically downloaded and used inside the browser — the user won’t even notice it. Let’s now see what we did to make the texts accessible and reusable for research. Links are also important for creating annotations. In fact annotations were a high priority for us. Text fragments: Can the user make annotations not only to sections but also to single words? Images: Again, can the user make annotations not only to whole images but to details inside the image? Sharing: Can the user create annotations for his scientific research and share them with other users? Replying: Can a user see another user’s annotations and make a direct reply? Exporting: Can a user export his annotations and keep them for himself? Interchange: Can annotations be interchanged between different annotations systems? Archiving: Can the annotations be preserve for the future? Scope: Can the annotation system be used for all web sites and documents across the internet or is it a closed environment? Some systems do not allow their users to make annotations to any website or text on the internet, but only to a given website. Kind of user lock-in where the annotation tools can only be applied on the documents hosted on one specific web site. First, Annotator: a free/open source annotation tool which can be used for the Perspectiva material but also for other websites. It’s only down side as of today is its lack of backend functionality. Third, Highlighter: another commercial system with a really great backend but which is restricted to the Perspectiva website. Our users can test these tools and choose the annotation system they prefer. A short help section for how to use the different systems is displayed on every page. For sake of brevity, I’ll now show only the Annotator system, mainly because it’s the most technically interesting. Annotator is one of the projects hosted by the Open Knowledge Foundation (link). Its development (link) is being done alongside the specifications to an annotation framework defined by the Open Annotation Collaboration project (link). Therefore there is little chance that the service could one day get shut down. From an end user perspective, this means vendor-neutral annotating, and even a possibility to be compatible with future annotation services. 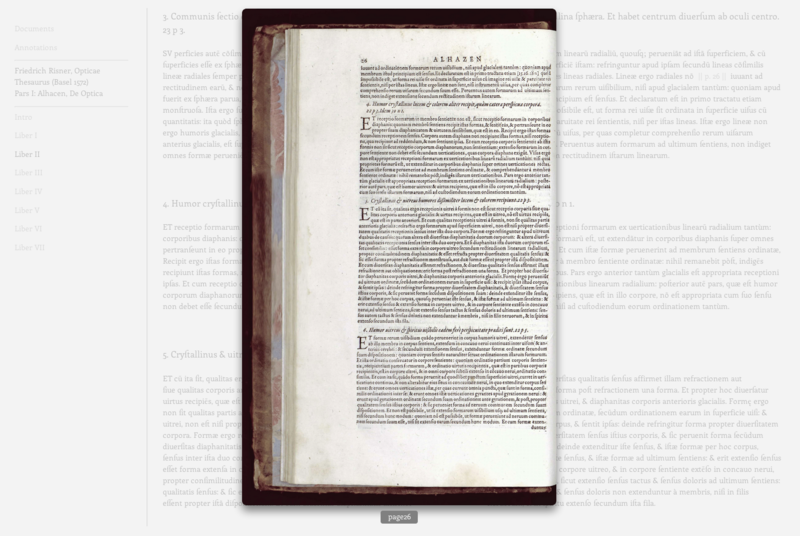 Here are some screenshots of the Annotator tool in use on the Perspectiva+ site. We start to write our annotation … in this example we want to refer to a similar introduction by Risner made in part II of his volume on optics, by Vitelo. Then we prepare the actual URL link, using parentheses. Now we have to switch to the text we want to link to and copy the citation link! 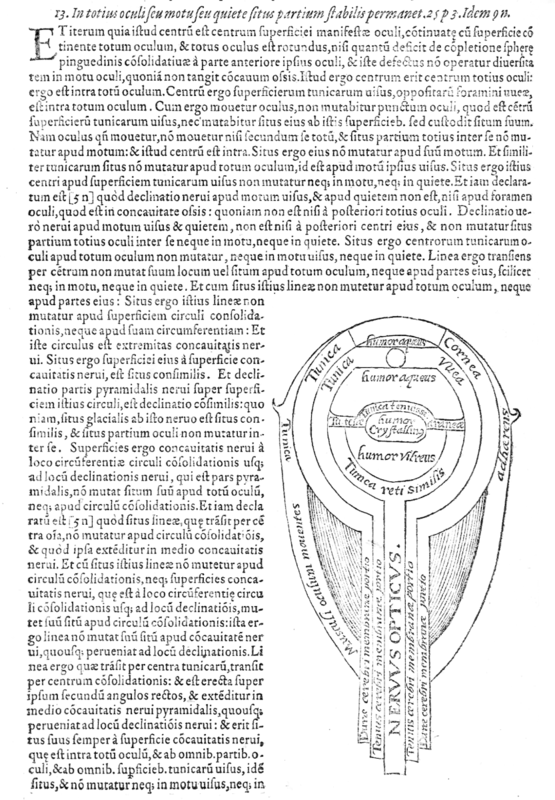 Here we are in the Vitelo part of Risner’s publication – the blue buttton becomes visible on hovering and shows the citation link. The use of cross-links inside documents or from one document to another (even on another website!) allows scientific reuse. Different users can annotate the documents, re-edit them and, if they want so, even share their annotations. What’s still lacking in the Annotator system is a print functionality, so users can print their annotations alongside the original documents, and annotations for images. We hope to be able to provide at least the latter inside the project time frame. Talk held at the conference “Perspective as Practice: On the Circulation of Optical Knowledge In and Outside the Workshop”, Berlin 12-13 October 2012. The relevant PDF is PerspectivaSlides, the original presentation file is PerspectivaSlides-ODP.